A first-mover in its category, Violet 3D wanted to introduce the real theater experience at home. Completely wireless, this next-generation immersive surround sound system was long overdue in the Indian market. We made full use of our design thinking capabilities to give Violet 3D a futuristic look-and-feel. Moreover, the design elements were supported by killer taglines like ‘Go from living room to multiplex’ and ‘Welcome to the future of SOUND’. We covered the full range of services from digital to offline ads, from chic magazines to massive hoardings outside the Bengaluru International Airport. 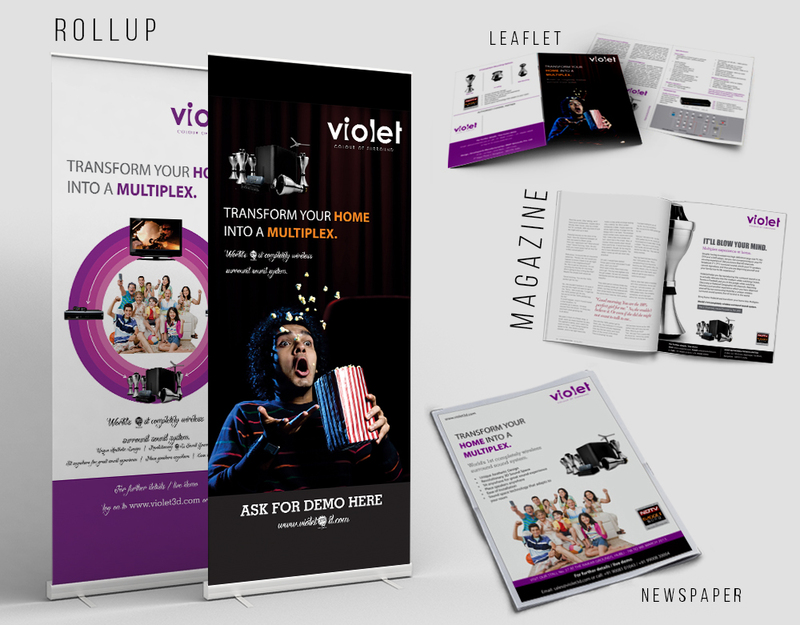 Based on our vast experience, we understood that design solutions would play a key role in marketing a brand like Violet 3D. Violet 3D entered the fray to a thunderous applause as audiences were spellbound by the immersive and experiential potential of this new age surround sound system.